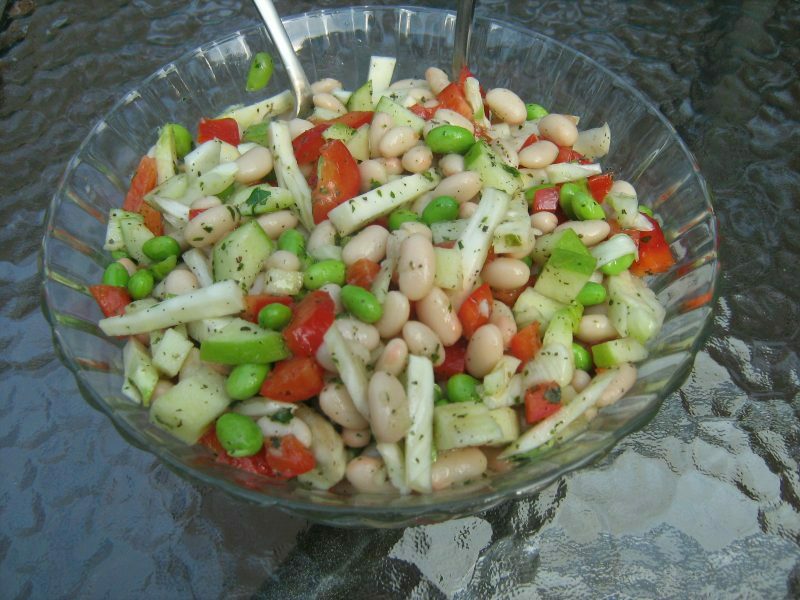 Easy Gourmet Recipes - Vegan Bean Salad Recipe. Healthy natural recipes including breakfast recipes, appetizer recipes, soup recipes, pasta recipes, holiday recipes, party recipes, dessert recipes, gluten-free recipes, raw recipes and budget recipes. A huge thank you to Rich from Not Just Recipes for sharing this easy vegan recipe with us! This deliciously sweet vegan bean salad is protein-packed and makes a great vegan side dish or vegan main course. With its winning combination of crunchy sweetness, tart apple and delicious peppers and beans, this salad makes a super yummy quick and easy vegan meal! 1. Cut fennel into thin slices. Finely dice the red pepper and Granny Smith apple. 2. Drain and rinse the beans and place them in a large bowl. Add in the fennel, red pepper, edamame and apple. 3. In a blender, combine the juice, olive oil, mint, basil, garlic and vinegar. Blend until fully pureed and smooth. 4. Add to the bowl with the solid ingredients. Toss gently to coat. 5. Season with salt and ground, black pepper. Chill for at least 30 minutes. 6. Serve on a bed of romaine, baby spinach or thinly sliced tomatoes. Note: Goes well with a nice fresh piece of rye or pumpernickel bread.